The one thing that John Abraham is best at is choosing different kind of films. Just look at his film choices- 'Water', 'Vicky Donor', to name a couple. And this time the hottie of Bollywood is all back with his new film called 'Parmanu: The Story of Pokhran'. 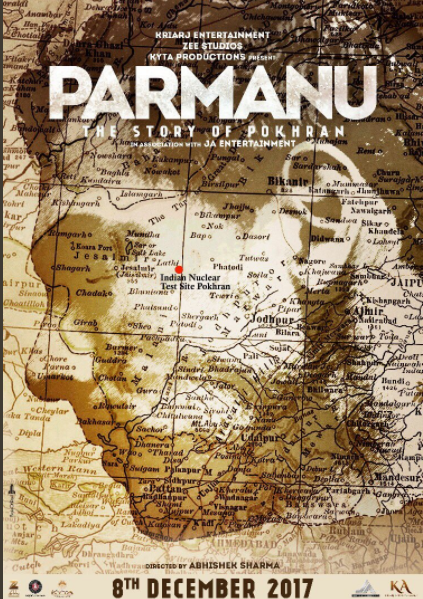 The poster contains a map of Rajasthan over John's face with a red dot legibly out that marks the site of the famous 1998 Pokhran Nuclear test. The film will be directed by Abhishek Sharma and has just gone on of floors for shooting. As per a leading daily, 'Parmanu' will not be shot at Pokhran but at Jaisalmer in Rajasthan. Stars Diana Penty and Boman Irani will also be seen alongside John Abraham. John Abraham was last seen on celluloid in 2016 in his films 'Force 2', 'Dishoom' and 'Rocky Handsome' along with a special appearance in 'Wazir'.